Before the start of the series, Yuuno lived in Mid-childa, a magical world, as an archaeologist. He had no parents, so was raised by his entire tribe, the Scrya, from which he took his surname. He also obtained or created the intelligent device Raising Heart around this time, but his talents lay as a support mage, and so his attack abilities were low and he never made the device into a weapon. Yuuno first appears running from a gigantic monster in the woods and attempting to seal the Jewel Seed inside it with Raising Heart. He fails, letting the monster get away, and collapses wounded on the ground. Yuuno uses his remaining power to call out to the nearest magic user and turns into a ferret. His call was heard in Nanoha Takamachi's dream, and later that day, she found the ferret in the woods and took him to the veterinary hospital. He quickly recovered, taking a liking to Nanoha and recognizing her as a possessor of the magical aptitude, a rarity on Earth. Later that night, he calls out to Nanoha again and she leaves the house and finds the Yuuno-ferret cornered by the same monster. He entrusts her with his weapon, Raising Heart, and seeing her raw power when she activated it, deduces that she can create magical armor and turn Raising Heart into a weapon of her design. She does so and begins her journey to seal away Jewel Seeds. It turns out that Yuuno discovered the Seeds on an excavation, but officials of the Time-Space Administration Bureau lost them on Earth. 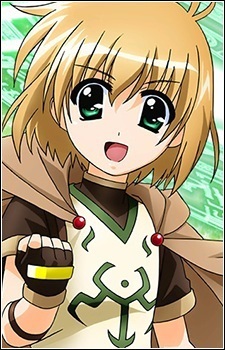 Though Yuuno searches for the Seeds while Nanoha is busy, and though he fears that she is too inexperienced, he quickly recognizes that she is more powerful than anyone he has ever seen. When Fate arrives on the scene, Yuuno begins to fight Fate's familiar Arf while Nanoha is busy with her rival. This is the first time that Yuuno is referred to as Nanoha's familiar, but Nanoha replies with "We're friends," a line later echoed in the first episode of A's, under different circumstances. This whole time, Nanoha is unaware that Yuuno is a human male, leading to a running gag of some embarrassing situations with girls changing and especially during the onsen episode, and every time he panics and looks away. In episode 8, though, Yuuno reveals his identity to Nanoha. Once Lindy Harlaown and her crew arrive to deal with the situation, Yuuno convinces her to allow him and Nanoha to continue their retrieval mission and is let off with a slap on the wrist when he ignores orders and allows Nanoha to help Fate seal six Jewel Seeds at once. At the end, he, Nanoha, Chrono, Arf and finally Fate team up to defeat the real enemy, the adamantly insane Precia Testarossa. Yuuno cannot return to his own world for at least 6 months due to the aftereffects of the collapse of the Garden of Time, so he remains as Nanoha's pet. However, just before the start of A's, he returns to work with the TSAB and help with the trial of Fate and Arf. Yuuno finishes up helping Fate with her trial, and he still does not get along with Chrono, due to their rivalry over Nanoha. When news comes that the most sought-after Lost Logia, the Book of Darkness has surfaced, the Asura mobilizes to retrieve it, and once Yuuno and company learn that it is in Uminari City, they take the assignment right away, Fighting off the Wolkenritter, who take the Linker Cores (magical power sources) of unsuspecting mages to complete the Book, Yuuno becomes more and more useful in both forms as a backup and overall white mage; his counterpart in the opposition is Shamal. Yuuno also resumes his civilian life as Nanoha's pet, and is subsequently showered with attention by Nanoha's friends and family. Unlike in Nanoha, humor in A's at his expense is less common, save for deadpan jokes from Chrono and a gag scene where Nanoha dreams of eating baked sweet potatoes but instead bites Yuuno in her sleep. In the epilogue which takes place six years later, Yuuno continues to work for the TSAB as chief librarian of the Infinity Library, now wears glasses, and is confirmed to support Nanoha and Fate's relationship from the distance. Yuuno returns in episode 7 of StrikerS during an auction of several Relics at a hotel. Due to his position as chief librarian of the Infinity Library as well as his experience as an Archeologist, he was called to speak at the auction for his expertise on Magic Relics. Later (in episode 8) he has a happy reunion with Nanoha, their relationship still shown as a strong one. He does not seem to have much of a larger role or many apperances in this final installment of the trilogy until the very end, where he makes an appearance in the Infinity Library.